The Cabo San Lucas Desert Spa is an award winning 31,000 square foot spa and the largest in the state of Baja California Sur, with 17 state-of-the-art treatment rooms, two exclusive VIP suites with private Jacuzzis and showers, a full-service beauty salon, incredible Hydrotherapy Circuit, and a world-class Fitness Center. It's true: You are in one of the most serene and beautiful locales in the world. And, we invite you to take full advantage! Visit our Desert Spa to cap off a perfect vacation. Whether you indulge in our popular aromatherapy massage using Baja California fruit extracts or enjoy the "sportsman combo" designed exclusively for men, you will feel pampered and fully relaxed. Villa del Palmar’s on-site European-inspired spa offers dozens of treatments both popular and unique in an expansive space complete with an adjacent fitness center. Our spa menu features indulgences, such as massages, body wraps, facials, hydrotherapy, and couples' experiences. 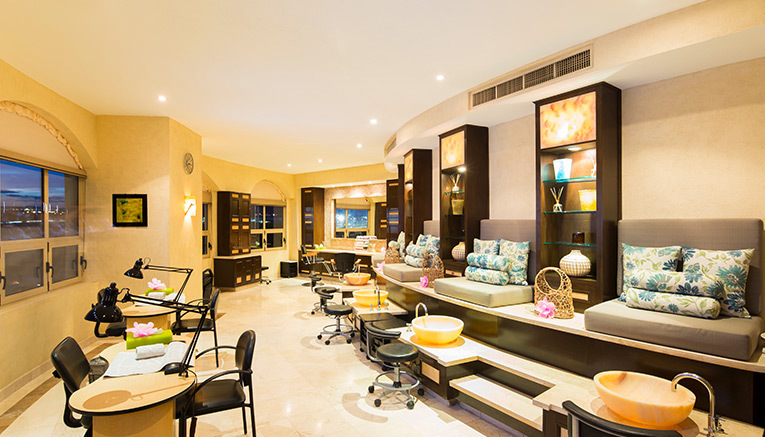 In addition, it boasts a full service beauty salon as well as a la carte services and special packages. We welcome you to peruse the wide array of treatment offerings and book in advance of your trip or while you're here. This exclusive wellness facility offers its guests a multitude of services and treatments to achieve ultimate relaxation and health. Turn back the clock with this result driven anti-aging facial. After a professional assessment and cleanse, a stimulating cinnamon enzyme peel brings oxygen and nutrients to the surface cells while dissolving rough skin and revealing a more vibrant complexion. This is immediately followed by a series of collagen inducing masks and a unique protein enzyme that activates cellular metabolism. The result is tighter, brighter and more youthful looking skin in only one treatment. The elements can take a toll on your skin leaving it dehydrated, lackluster and inflamed. This facial directly addresses and corrects these concerns. After gently cleansing and exfoliating, a custom blended, mineral rich mask is applied to balance, calm and hydrate your skin. A soothing facial massage is then given using the finest penetrating rose oils to bind moisture to the skin, oxygenate it and reduce sensitivity. The treatment is then sealed under a cooling green tea, cucumber, and aloe vera blend that leaves the now vibrantly healthy skin protected and petal soft. Utilizing some of the world’s most effective purifiers, this deep cleansing facial promises to give clarity to even the heaviest skin types. Alpha-hydroxy acids are paired with a micro-derm scrub to effectively smooth and refine the skin’s surface. This is done in preparation for gentle extractions and a volcanic clay mask that draws out impurities. The result is a fabulously clean and clear complexion. This is true and utter bliss. This time-honored classic Swedish-style massage nurtures and relaxes the whole body. The gentle-to-firm full body massage enhances circulation and soothes tired muscles. You will feel gentle restoration within yourself. This is a deeper more vigorous massage that is designed for those familiar with concentrated muscle stimulation. It is best suited for the individual looking to release inner muscular tensions. This specialized massage is intended to reduce pain and increase mobility in individuals with chronic aches. This massage can be uncomfortable for some as the pressure to release the contracted soft tissue can be profound and the necessary stretching can be intense. This massage is done without using any oil or lotion, so you may remain clothed if desired. Welcome to a very relaxing and indulgent way to spend the morning or afternoon in beautiful Baja California. We begin with an enticing full body scrub. This is followed by a hydrating mineral mask with pineapple, mangosteen and aloe vera. This wonderful experience of the senses ends with a full body application using a high-quality body lotion formula. Treat your body like a temple with this detoxifying and firming treatment, guaranteed to leave you sleek and smooth. This treatment begins with dry body brushing to stimulate lymphatic drainage and detoxification. Your body will then be covered in an Espresso Limón Slimming Oil especially formulated to purify and tone the body. This luxurious treatment will keep your body looking fabulous all year round. Indulge in the healing and hydrating properties of coconut milk. This total body experience begins with a 15-minute soak in a swirling blend of Kukui, coconut, marigold and chamomile. Then you are invited to relax as your therapist administers a luxurious coconut milk massage of 50-minutes that is sure to leave your entire body refreshed and revitalized. This tender couple’s experience is offered in one of our expansive spa suites, which includes a private bathroom and a large whirlpool. This passionate moment includes a couple´s massage followed by 25 minutes of private relaxation with your loved one to enjoy a bottle of sparkling wine and varied fruits dipped in chocolate. Looking to try a new spa experience with your partner? Give in to this fun, romantic adventure that will enliven your senses. Using a sweet, brown sugar mix, two therapists will provide the couple with full body exfoliations to improve circulation while leaving the skin clean and soft. The couple may then use the spa suite’s shower to clean off the excess product. The final delight is a massage for two where each partner has their own therapist. To create the most divine memory for a couple on vacation, indulge in this exceptional Desert Spa moment offered in one of our two luxurious spa suites. Couples begin their romantic adventure in the aromatic water of a Jacuzzi while being pampered with neck, shoulder and scalp massages given by two massage therapists. This is followed by a relaxing massage, with each person having their own personal therapist. For those who take their grooming seriously, the gentleman's hand therapy includes a natural buff, cuticle trimming and an application of our own Desert Spa hand lotion. It will leave you with impeccable hands and nails. Designed specifically for men, this custom foot treatment will polish off excess dead skin, remove cuticles and cut and buff your nails. It is a healthy grooming necessity for men of all ages. Male grooming at its very best! Enjoy this hot towel facial as it purifies, hydrates and protects your skin without ever making it feel weighed down. This treatment includes a volcanic clay mask to refine your rugged good looks and a scalp massage to relieve any stress. To create a look especially for you, leave it to our professional makeup artists to find the color palette that most accentuates the beauty you possess. Whether you want light and natural or bold and dramatic, we can bring out your inner model. The Desert Spa mini-facial is sure to prepare your skin for a flawless presentation. Having a pure canvas to work with makes your makeup application not only indulgent but guaranteed for a superior finish. Whether you desire an elegant up-do or a soft, natural flow on your wedding day, our hair stylists can create your designer look. Come in and relax in the very capable hands of a hair professional. This luxury for your hands includes expert cleansing, cuticle removal, shaping, exfoliation, a highly hydrating hand wrap, hand massage and your choice of nail polish. Spoil your feet with the ultimate foot love, including a deep cleansing, nail shaping, cuticle removal, exfoliation, an incredibly hydrating foot wrap, foot massage and your choice of nail polish. It’s the little things that often matter most, like having the perfect color on your nails to add the desired detail to your overall look.